Pictures are a great motivational tool when losing weight. You want to take a before picture for obvious reasons, but you also want to take many pictures throughout your journey so you can compare your current picture with your before picture. If you have something to compare how you look now versus how you looked before, then you have your motivation to keep losing weight so you can see how thin you will be in the future compared to how you are now. These are the pictures that I have taken on my journey. The top left is obviously my before picture. I say it was taken on January 1st 2013, but I think it was the day before. It doesn’t really matter though. I weighed 264lbs in that picture. We were at a Denny’s restaurant having breakfast. The bottom right is the picture that I took halfway through when I had lost 28lbs. I had gotten a white Noom t-shirt and I wanted to show it off. The top right I took because I wanted to get a picture of how my dog Flower was laying on me. I was pleasantly surprised at how skinny my face was getting. The top middle is the picture I took when I realized that I had lost so much weight that I was finally able to wear that dress shirt buttoned all the way to the top. 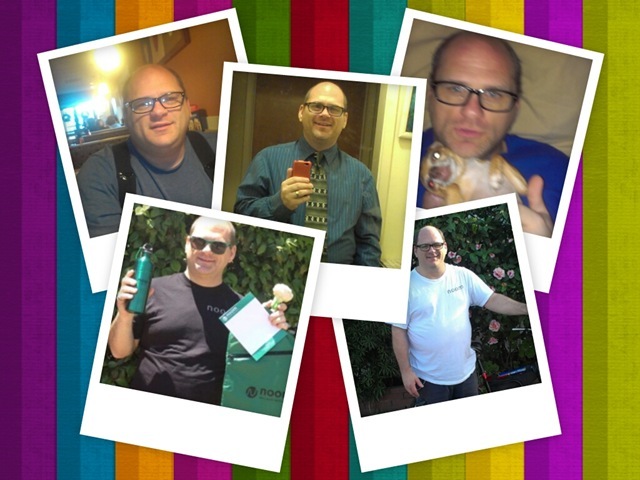 Then finally the bottom left picture is my most recent picture with my Noom swag. I weighed 206lbs in that picture. It’s important to me that I see my before and after pictures to remind me how skinny I am actually getting because sometimes I look at myself in the mirror and can’t see anything different and I get discouraged. When I look at the pictures and see how skinny I am actually getting, it gives me hope and helps me to keep going. It’s funny how the mirror really effects how we see ourselves compared to how a picture shows us how we really look. I know that a reflection is the same exact thing as a picture, but it’s different, I don’t know how to explain it. It’s the same thing, only different LOL. Anyway, I am very pleased with my progress of losing 57lbs and I will keep eating healthy so I can continue losing this fat until it is finally all gone.